This Saturday’s event is focused on operating your sidearm with only your support hand (left hand if you are right handed). We have four exercises planned for Saturday. We will start the event by demonstrating techniques for loading and putting your sidearm into battery using only your support hand. We will then give everyone the opportunity to practice these techniques dry, prior to starting the live fire exercises. Exercise one is a tactical test that will reinforce one-handed draw and fire techniques using live fire. Exercise two is a tactical test that exercises malfunction clearance using only the support hand. Exercise three is a simulated defensive encounter requiring you to address an encounter at an ATM using only your support hand. Exercise four is a simulated defensive encounter requiring you to address a home invasion using only your support hand. 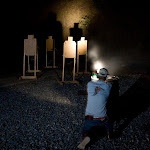 Please bring your handgun, a strong-side holster, a magazine pouch, extra magazine(s), and at least 100 rounds of ammo (bring extra, if you would like to shoot additional exercises or shoot steel after the scheduled exercises). Set up starts at 8:00 a.m.
New shooter orientation starts at 8:30 a.m. Registration starts at 8:45 a.m. Shooting exercises start at 9:00 a.m.